Geoff Hunter was as an American mechanical engineer and scientist who for the aerospace company Rocketdyne. He participated in a gravity experiment that was part of the feature-length documentary film Einstein Wrong - The Miracle Year. Geoff Hunter participated in a gravity experiment as designed by Dr. Ricardo Carezani whose purpose it was to try and prove that gravity is caused by a particle called the graviton. The experiment was part of the feature-length documentary film Einstein Wrong - The Miracle Year. 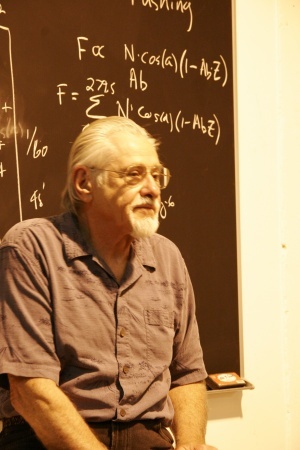 Geoff was in charge of the mechanical arm and authored a paper along with Robert de Hilster and David de Hilster, presenting their findings in 2007 at the Natural Philosophy Society at the University of Connecticut. Geoff was one of the main characters in the Einstein Wrong documentary and also participated as a production assistant. Geoff was an avid music lover, specifically percussion. He played many percussion instruments and played almost 20 years in the samba group SambaLa Samba School. Goeff Hunter was a mechanical engineer at Rocketdyne where he said they used to blow up rockets all the time and then go find the pieces to discover what went wrong. Geoff was married to Maija Hunter and had two sons. He died of heart failure in December of 2018 in Malibu California.